This house originally had a full chimney where the three new front windows are, blocking the view and light in the living room. The fireplace was deteriorated and never used, so the chimney was removed. The original porch was only half this size and over it was a small, flat roof that collected water in a puddle. 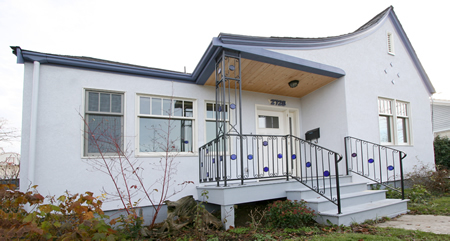 The rebuilt porch has a new, curved roofline similar to many other houses of this style. Constructing it involved some complex framing and bending a wide piece of molding with a site-built steam box. The back entry was covered with a custom built awning that could fit under the electrical supply conduit. 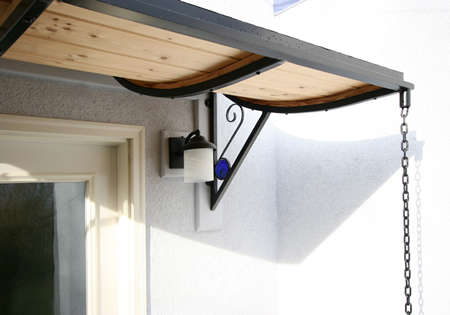 This involved coordination between the carpenter, metal fabricator, powdercoat painter, and the custom glassmaker for the blue circles. 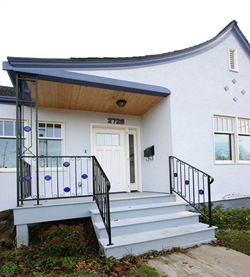 The homeowner worked directly with the glassmaker and metal fabricator to design these details. The project involved extensive stucco repair to whole wall surfaces. 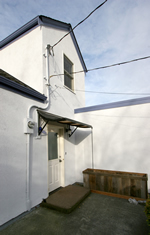 The original stucco had deteriorated badly and in places was completely separating from the wall. Half the windows in the house were replaced, as well as the front and back doors. 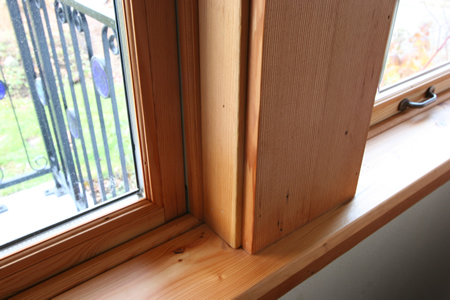 The interior trim is a collection of fir from many different sources. The window units are new fir, as well as the extension jamb pieces. The casings and apron pieces are recycled material that the homeowner purchased at the REStore and prepared for installation. And the stools (sills) were selected pieces of sustainably harvested fir from the supply used to frame the rest of the project.